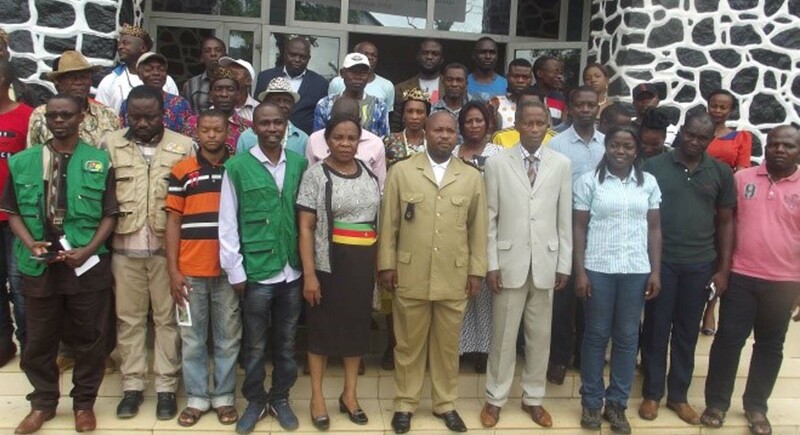 Farmers day was organized to generate awareness about the Banana bunchy top virus (BBTV) disease in Amban City Hall, Cameroon on 20th November 2018, to inform “bunchy top” infected plants are not “suckers”, how to recognize disease infected plants and means of eradication. Event co-hosted by IITA and MINAGRI as part of the CGIAR Roots, Tubers and Bananas (RTB) project, ALLIANCE for BBTV control in Africa. 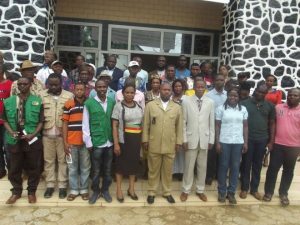 Fifty-two persons participated in this day amongst which (16 extension workers-Ambam Division, 13 village leaders, 4 local of Ministry of Agriculture, 2 quarantine/phytosanitary workers, 7 officials and some producers). This awareness day contributed to (i) inform the administrative authorities on the actual situation of BBTD in the fields; (ii) participants informed about the cause, symptoms and control measures; and (iii) advice to use healthy planting material and avoid transferring suckers from infected zones. The meeting was chaired by Mr Eric AVOM ALARA National Coordinator Fruit Program-Ministry of Agriculture. In the key note address, the Divisional Delegate of Agriculture evoked the negative effect of BBTD on plantain production; he pleaded the extension workers to pay attention and retain information shared during this day in order to intensify sensitization in their respective area. In the welcome address, the Ambam Mayor recalled the importance of plantain in livelihood and local economic, if plantain is endangering then the frontier market will collapse and consequently, the local economy is compromise. The Sub Divisional Officer of Ambam, expressed his wish that the recommendations of this day will be strictly followed to take concrete and effective actions to tackle BBTD, the plantain menace. Dr Sergine Ngatat of IITA gave an overview on BBTD, transmission and control methods. Avoidance of disease using healthy suckers from reliable sources was advocated. 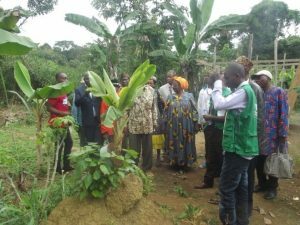 Mr Eric AVOM ALARA National Fruit Program (PNDCF) highlighted the situation of BBTD in Cameroon from 2008 to 2018; its original area (Abang Minko’o) to its spread into new areas (Ambam, Mekoe). This presentation underlined that, BBTD has spread about 30km from its original focus to new villages; If no action is taken, this disease will continue to spread insidiously in the country so the necessity of this day to raise awareness about the disease. Mr ESSISSIMA Officer Agriculture development/phytosanitary intervention indicated control measures undertaken by the Ministry of agriculture. This presentation brought out the importance of plantain production in Cameroon. Plantain ranks 12th for income generation in Cameroon. Creation of seed fields to supply clean planting materials in BBTD affected zone.